The only choice for racing. The 2006 YZ250 was the unanimous winner of the 2006 Inside Motorcycle MX shootout. 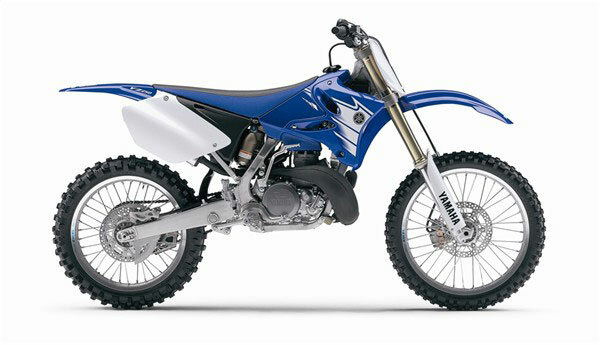 For 2007, we have tweaked the YZ250 for a little more power, enhanced suspension performance and reduced weight. Out of the crate race “goodies” include a lightweight Beta titanium spring on the rear shock and new Pro Taper handlebars. 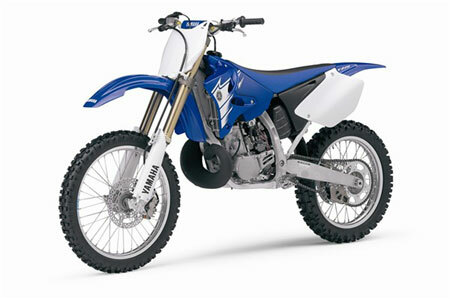 – Liquid-cooled, 249cc, piston-reed-valve-inducted, 2-stroke engine is lightweight and compact. Its reputation for exceptionally broad, hard-hitting powerband will continue for 2007. 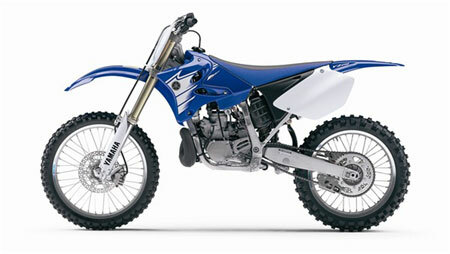 The YZ250 won the 2006 Inside Motorcycle MX 1 class shootout. – The cylinder feature a ceramic composite coating which insures uniform heat dissipation, reduced friction and a longer service life. – YPVS power valve system features a total of three slides (one main and two auxiliary slides) which provides the benefits of both solid, low rpm power delivery and a strong top-end punch. 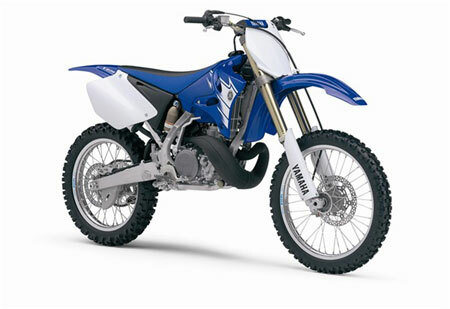 The YPVS system varies the exhaust port height and timing based on engine rpm. The valves are also designed to match the curvature of the cylinder resulting in a strong seal, thereby providing increased power delivery. – Revised Keihin PWK38 carburetor with power jet and throttle position sensor (TPS) ensures precise fuel/air mixing and extra-crisp throttle response throughout the powerband. The needle jet is changed for improved low to mid rpm power delivery. – Special-design, 4-petal, carbon fiber reeds provide great throttle response and engine performance across the entire RPM range. – Smooth-shifting, 5-speed, close-ratio transmission with heavy-duty, multi-plate clutch ensures optimal hook-up for outstanding acceleration and corner-exiting power. Transmission shafts utilize involute splines for smooth, positive shifting. – Digital CD igntion system delivers precise spark and monitors engine speed to ensure optimal timing for faster, stronger response during hard acceleration. – Washable, dual-stage, foam air filter reduces maintanance costs. – Large-capacity, dual radiators feature a 10-row core with 4 louvers to deliver maximum cooling efficiency. – Computer designed expansion chamber provides maximum engine performance while the lightweight, aluminum silencer is rebuildable so performance can be maintained at the optimum level and noise levels can be controlled. – Trick, works-style clutch lever features a race-spec “barrel adjuster” for on-the-fly adjustability. – Lightweight, aluminum, semi-double-cradle style frame was a completely new design in ’05. The obvious benefit of an aluminum frame is a significant reduction in overall machine weight. Yamaha has maintained the semi-double cradle design because it offers an excellent balance between stiff lateral and torsion rigidity while offering more controlled flex in the longitudinal plane. This frame design offers the ideal “stiffness balance” which means it offers the flexibility of a steel frame with the light weight of an aluminum frame. This frame is made from a unique mix of castings, forgings and extrusions that provide stiffness where it is required and flexibility in other areas. The result is the world’s lightest aluminum MX frame, which provides excellent handling, good ride quality, excellent stability and responsive cornering performance. – Removable rear subframe is constructed of square-section, lightweight aluminum pipe. Detachable design allows easy access when servicing rear suspension components. – Lightweight, tapered, aluminum swingarm is produced using “hydro forming”, a special forming method that uses high pressure water to form shapes. – Cast aluminum upper triple clamp and forged lower triple clamp provide both lightweight and strength for fast, easy handling. – The fork pitch (or separating width between the tubes) has been optimized for lightweight, responsive handling. – Adjustable handlebar mounts allow the handlebars to be moved 10mm rearward if desired. – Speed sensitive 48mm, adjustable, inverted, Kayaba cartridge forks feature a twin-chamber design. The twin chamber design means the damper unit is in a separate structure which prevents aerated fork oil from entering the inner damper assembly and degrading its damping abilities. Since the inner damper is pressurized, it also eliminates bubbles forming in the oil. The speeds sensitive design mean the damping force is controlled by piston speed. – The balance between the inner and outer fork tubes has been optimized, while the Kashima coating on the pressure tank and the piston rod reduce friction for smoother suspension performance. The cylinder diameter is 24mm for improved primary cushioning while a low friction oil seal provides reduced stiction. – Revised 48mm KYB fork features a redesigned outer fork tube with optimized thickness and rigidity for superb handling. This fork also features a Transfer Control Valve (TCV). The TCV enhances the damping force of the inner damper from mid stroke to full stroke and improves bottoming characteristics. The benefit of TCV is more precise control throughout the full stroke range. – “Kashima coating” is applied to the fork tubes to reduce friction for smoother suspension performance. Front wheel travel is 300mm (11.8″). – Front fork adjustments include: 20-way compression damping and 20-way rebound damping. Optional fork springs are available through Genuine Yamaha parts. – Large, semi-wrap-around plastic fork protectors provide excellent protection from stone / rock chips. The “self-supporting” design helps to reduce friction for smoother fork operation. – Revised Monocross link rear suspension system features a fully adjustable, Kayaba, piggyback shock which provides 315mm (12.4″) of wheel travel and features separate adjusters for high- and low-speed compression damping. There are numerous internal material changes inside the shock body. Aluminum has replaced steel components in the sub tank and shock body for reduced weight. Adjustments include: spring preload, 20-way rebound damping, 20-way low-speed compression damping and 2 turns of high speed compression damping. The damper rod diameter is 18mm in diameter, while Kashima coating is used in the shock body and sub tank to reduce friction and improve suspension performance during a long moto. The 2007 Kayaba shock utilizes a full rebound oil lock system for excellent suspension function and great ride quality. – Super lightweight, “Beta” titanium shock spring. This spring reduces weight by over 500 grams versus a conventional steel spring. A reduction in “unsprung” weight , causes a dramatic effect on suspension performance. This titanium spring provides outstanding strength, and durability, combined with reduced weight. – 250mm floating front disc brake utilizes a twin piston caliper with aluminum pistons for excellent brake feel and control. The front brake lever shape has been revised for better feeling. – 245mm rear disc brake with single piston caliper uses an integrated master cylinder (fluid reservoir is integrated into the top of the master cylinder) for strong stopping power with excellent feel and control. – The rear brake caliper features a rugged plastic caliper protector, while the lower edge of the disc is protected by a lower disc guard. – Specially designed “Sun Star” rear sprocket increases the contact area between the sprocket and chain rollers, thereby reducing the load on the chain and increasing the service life of both chain and sprocket. – Lightweight, 21″ front and 19″ rear Excel rims provide exceptional durability and help reduce unsprung weight for optimal suspension performance and handling. – Specially designed rear wheel collar is tapered to allow for faster, easier wheel removal installation. – All new lightweight Pro Taper handlebars with reinforcing crossbar and foam pad provide excellent durability and reduced weight. – Premium Dunlop knobby tires offer excellent race-spec traction. – “Flat-design” seat features multi density foam that provides good initial softness / comfort and then increases the firmness as more pressure is applied. The “pebble” or “gripper” finish on the top and side surfaces provides excellent rider grip and durability. – Seat, handlebar and fuel tank ergonomics provide excellent freedom of movement for the rider. – New lightweight aluminum front axle nut reduces weight. – Large fuel cap and filler hole ensures easy opening and fast, hassle-free refueling. 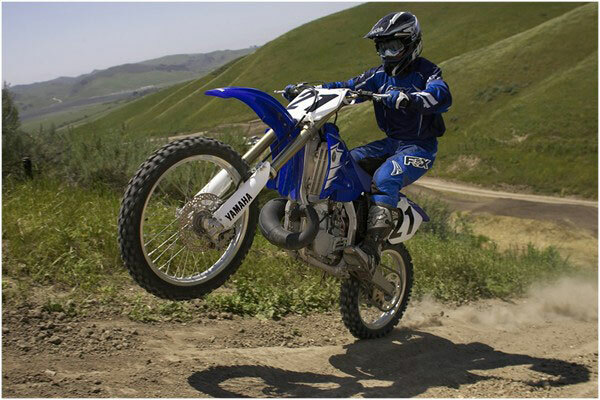 – Lightweight, wide titanium footpegs provide excellent grip and ground clearance. – Cleated, rear brake lever and folding shift lever tip offer superb grip and exceptional durability. – Stainless steel, inner clutch cable provides excellent strength and long life. – Repackable exhaust silencer means a rider can maintain optimum engine performance and reduced noise levels.